This week was my final build before next weekends’ half-marathon. I have not raced any distance longer than a 10km since October. This weekend marked the start of marathon training. I can’t believe it’s that time already, but May is just around the corner and I have big goals for this race (BQ I’m coming for you). Tuesday: 50 minutes easy, I ran home from work. Wednesday: Our group workout was promised to be “fun” which was a little scary, who knows what coach considers fun? What we were given was a fartlek workout marked my different coloured pylons indicating either go fast or moderate. It was 2 sets of 2km of this and we were paired up based on pace. I was with a kid 8 years my junior, but it was really fun! Thursday: 75 minutes easy, another run home from work. I also did a strength training session. Friday: 45 minutes easy, I switched it up and ran TO work (mind-blowing right? ), it was dark and felt harder than usual. I rewarded myself with an americano so that was worth it, in addition to starting my weekend as soon as the workday ended. I also did an NTC core workout. Saturday: The first day of marathon training! Our workout was 20 mins easy, and 2 x 15 minutes at marathon pace. We ended up going a bit faster than marathon pace, but that’s okay! I also did a NTC core workout, cause the weekend is the perfect time to fit those in. Sunday: 70 minutes easy, the taper begins for next weekends’ half-marathon. I went out to the trails and followed a bunch of different ones not really knowing where I would end up. That ended up being at the edge of the park and since I didn’t feel like climbing anymore I took to the road for the way home. It was a good mix of terrain and the park was beautiful! I also did a strength training session and an NTC Core Workout. Then I ate all the pizza. 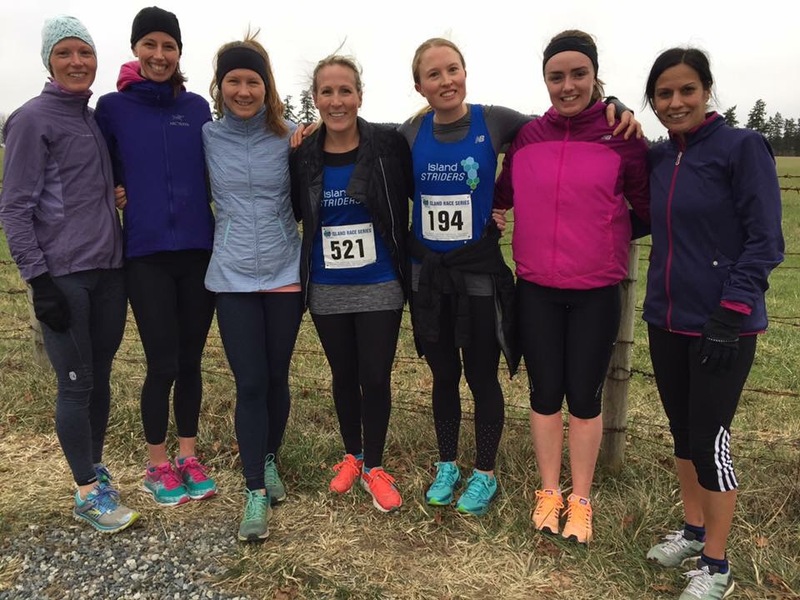 Last Sunday, January 22 was the second event in the Vancouver Island Race Series. I had heard rumours of rolling hills, but never completed the course myself so I was mentally prepared for some elevation changes. 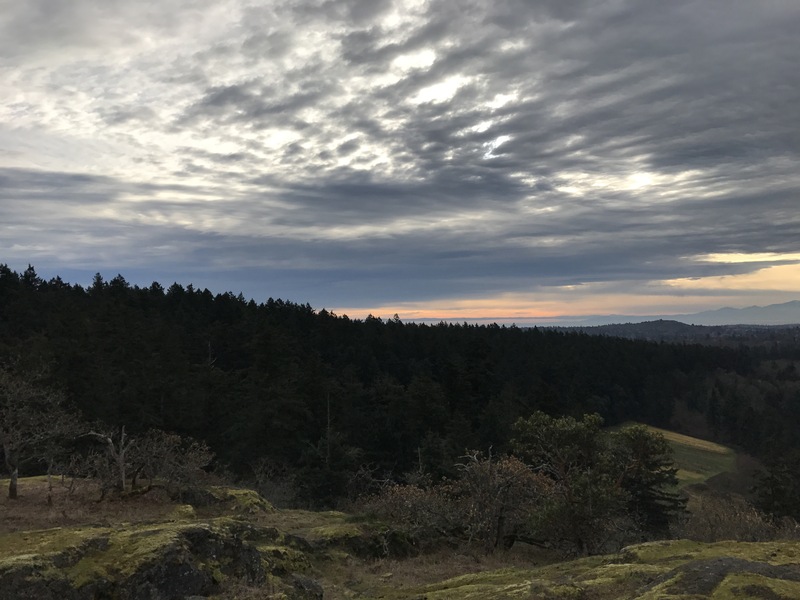 Cobble Hill is about 30 minutes outside of Victoria, so the girls and I met up and headed over together. Just as we pulled into the school parking lot, the rain began dampening our spirits. It was also much colder than we had expected. We grabbed our bibs, made the requisite 25 washroom visits and set out for our 20 minute pre-race warmup and strides. In spite of the weather there were still many others warming up alongside us so that helped. 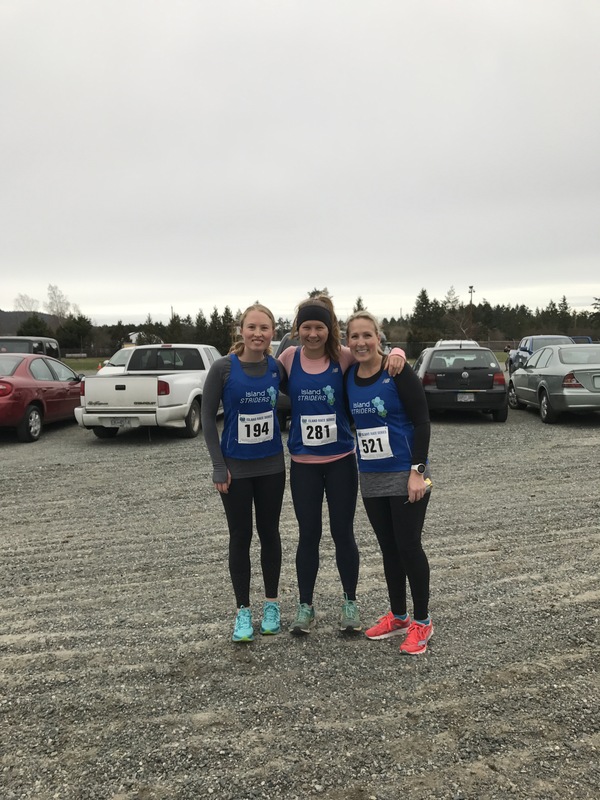 Once our warmup was completed we headed back inside to stay warm and get ready for the race, more washroom visits, suggestions of just going for brunch instead and gels. I had 2 on me as my target mileage was 19km, but ended up giving one to a running buddy. I took the mystery one with no expiry date. I am not sure whether to blame the gel, coincidence or what, but very shortly after taking the gel, I got a nasty stomach ache. I tried to ignore it and willed it to go away as we jogged over to the start line. Going into this race the goal was to actually “race”, so if we saw someone a bit ahead of us, do our best to catch up to them and hold the pace etc. I decided I was going to try to do this with one of the other ladies in our group, Cris. I also wanted to beat my 10km PB 44:28, but wasn’t sure how realistic that was given the terrain on the course. The race began downhill and I made an effort to control my speed, Cris was just ahead of me and that was fine. The first 2km were controlled at 4:29 and 4:28 which was what I had planned. The 3rd and 4th put more distance between Cris and I though I kept her in my sight, 4:35 and 4:36. I was not feeling well, my stomach ache was very much still present. I resigned myself to just completing the race as best I could. The 5th and 6th were the slowest of all, 4:43 and 4:46 -slower than half-marathon pace! I did recall hearing the last few km of the race are flat and decided to go for it. My time could still be salvaged I thought. I decided to start closing the gap between Cris and I. I could see Cris, but the distance was significant. I did the 7th km in 4:15, which helped make up time, but I still had more to make up in order to catch Cris. The 8th km had the final hill, but I powered up it in 4:30. I was getting closer to Cris for sure. During the 9th km I caught Cris and we started running together, it was a 4:10 km. I like to finish strong in every race and that means picking up the pace for the last km. We picked it up a bit, passing lots of people on the way. I finished the last km in 3:51. 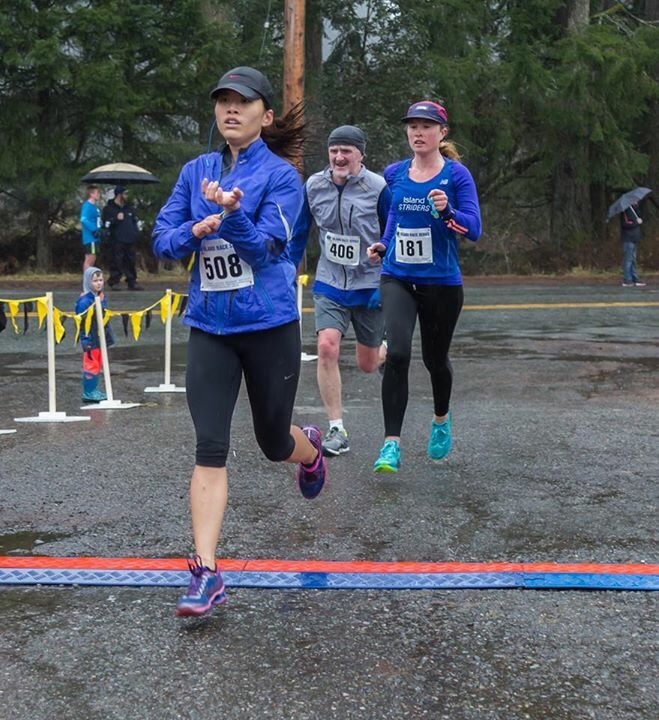 The race ended up going much better than I thought in spite of my stomach ache and the cold rain. I ended up squeaking in a 5 second PB, getting a third place medal in my age category and best of all, I caught Cris. This week started out a bit differently than normal. Since I am typically running 6 days a week, Monday is my rest day. However, this Monday was not a rest day. We tried something different, 10 days in a row running and then a day off and a shakeout run leading up to Sunday’s race. By the time the Wednesday workout rolled around, I was feeling pretty tired and I was lagging behind a bit in the workout. It wasn’t too long or intense though which was good. Monday: 40 minutes easy, run home from work. I also did an NTC core workout. Tuesday: 70 minutes easy, I went out to Dallas Rd to check out the waves, (love stormy evenings) and then home. I got in a 25 minute strength training circuit as well after my run. Wednesday: Group workout, after the warmup we did: 3 x 90 seconds at 10km pace, 4 x 30 second hill sprints and then another set of 3 x 90 seconds at 10km pace, followed by a cooldown. This was our pre-race workout, so nothing TOO crazy. Thursday: 40 minutes easy, a run home from work and then I did an NTC core workout. Saturday: 30 minutes easy, a shake-out run. Took this super easy! And then did nothing for the rest of the day. Sunday: Race day! We did a 20 minute warmup before the 10km and then 30 minutes after we finished. I will be posting a race recap mid week. Monday: OFF. I did an NTC core workout. Tuesday: 40 minutes easy, a run home from work. Wednesday: Group workout, which was a 20 minute warmup and then 2km at tempo, 4 x 1 minute @5km, 5 x 30 seconds @faster than 5km, 20 minutes easy. This workout was pretty fun, out intervals aren’t normally that short, so it was also a chance to really focus on form in fast running. I also did an NTC core workout. Thursday: 30 minutes easy, just a relaxed run home from work. I also did an NTC Abs and Arns workout. Friday: 30 minutes easy (again! ), another chill run home from work followed by an NTC core workout. Saturday: Group workout, after our warmup we did 6 minutes @tempo and 3-2-1-2-3 intervals followed by 3 x 3 minutes @10km pace and out cool down. This felt challenging. I also did a strength training for runners workout and spent some time rolling and stretching (for once). Sunday: Long run day, met the group to do our long run together for the first time. 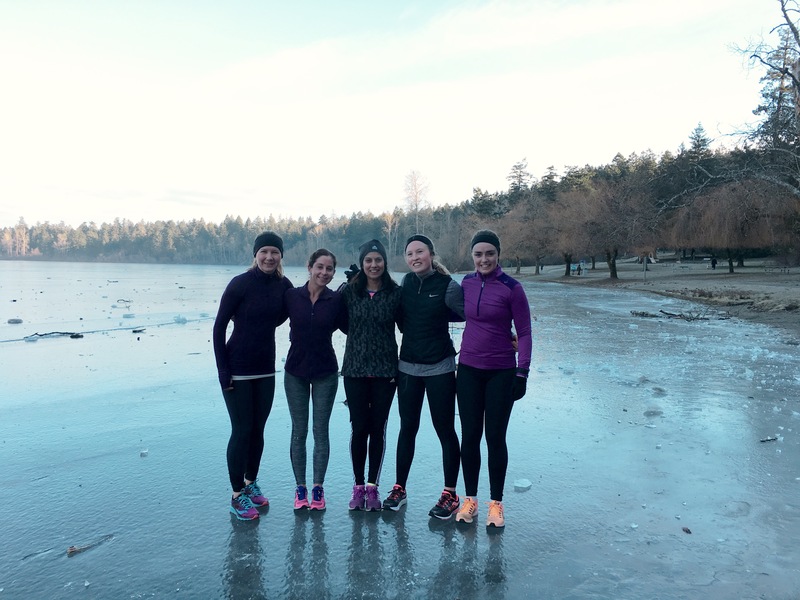 We headed out to Elk/Beaver Lake, a popular spot for Sunday long runs it seems! It was full of beautiful views and conversation to keep the pace in check, a great run! This week ends with a 10km race and again I will be racing this course with no knowledge of terrain etc, should be fun! It’s been a few weeks since I’ve written anything other than a training recap and that is no bueno! So, 13 days into the New Year, I am here to tell you about my goals and racing plans for 2017. Last year involved a lot of racing, and this year will too. I like to race often to take the nerves away from important races. 8km: 35:24 (though this was achieved last weekend beating my previous 36:12 from 2016). Goal #2: Boston Qualify at my next marathon, so for me, a time a couple minutes faster than 3:35. Looking at 5 minutes, maybe more! Realistically I will probably add a few more, but that is what I am currently registered for! This week was much lighter than the last 2 which was a great lead up to the first race of the season. That being said, I worked a lot and did not make time for strength training and core work. This week will be better! Monday: After working 11 hours I did 40 minute run home from work. Tuesday: I ran 70 minutes easy out to the ocean on Dallas Rd and then home. Wednesday: Group workout, we did a 20 minute warm-up and then 5 minutes at tempo, 4 minutes at 8km pace, 3 minutes at 8km pace, 2 minutes at 5km pace and then 3 minutes at tempo followed by a 20 minute cool down. It was a mild workout because of the upcoming race, but it felt great. Thursday: 30 minutes easy to get home from work. Saturday: 40 minutes easy, I went out on our regular Saturday workout trail. Sunday: Race day! We got to the event nice and early and headed out for a 20 minute warm-up run, it was pretty cold. The goal going into the race was just to run at a hard effort and not be overly concerned about time. While I know it’s early in the season, I find it hard to not be concerned about time. I reviewed my 8km PB time from the Race Roster 8km in March 2016 and saw it was 36:12. And then I decided I should beat that. Before I knew it, we were lining up at the start and I had no race plan other than to see what I had in me. We took off, downhill, which led to a very fast first km for the whole team. I find downhill starts challenging because it feels so good and easy, yet deceiving because when you hit the inevitable flat it feels hard. The flat didn’t last long though and we started climbing one of the many hills. This course had quite a few of them, which I didn’t know about, as I had no knowledge of the route before running it. It was definitely an awesome workout. 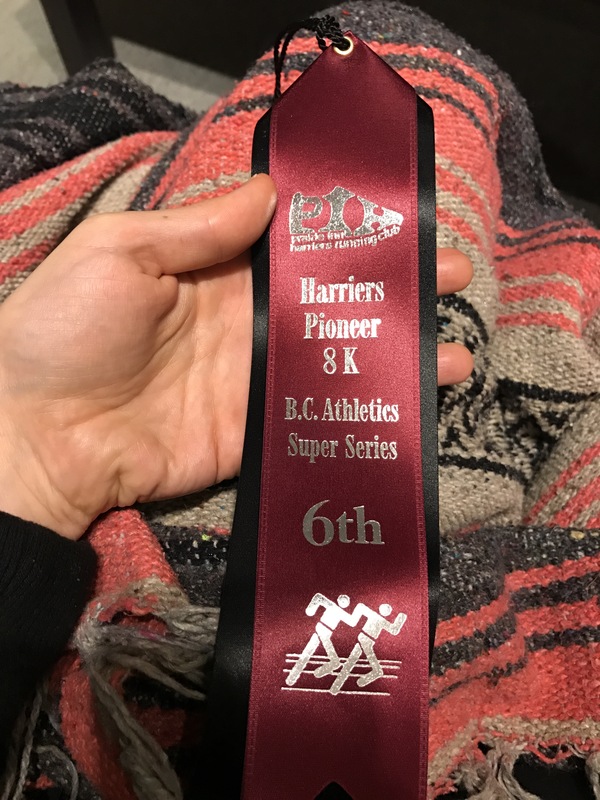 8km is a fun distance, it is very short, and felt so especially because the last race I ran was the Marathon in October. The course was a 5km loop and then an out and back with an uphill finish. I had no idea how it would go, but I did want to beat my 36:12 and I did just that! I finished with 35:24 and still felt good after. I am happy with this result at the start of the season, but I think I have more to give. Happy New Year! I hope your holidays were full of friends, family, and food! I had 2 big weeks of training during the holidays and have been too busy to recap. So this will be a massive holiday training recap. Monday: 40 mins easy, which was going to be a run home from work, but when I found out my Saucony Freedom ISO’s had arrived, I started my run from home so I could try them out. Tuesday: 70 minutes easy, I ran out to Dallas rd to check out the waves, it was super windy and they were crashing over the railing and then home. This was between work and my afternoon flight back to Toronto for the holidays, gotta fit the running in so you can sleep on the plane! Wednesday: 50 minutes easy, on the beach with my dad. Thursday: 70 minutes easy, with the last 10 minutes at half-marathon pace, my dad joined me for this too. Friday: 45 minutes easy on the beach and my dad joined me. Saturday: Work-out day, the regular 20 min warm-up followed by 3 x 10 mins at tempo, which was around 10km pace, and a 20 min cool-down. This felt pretty hard! 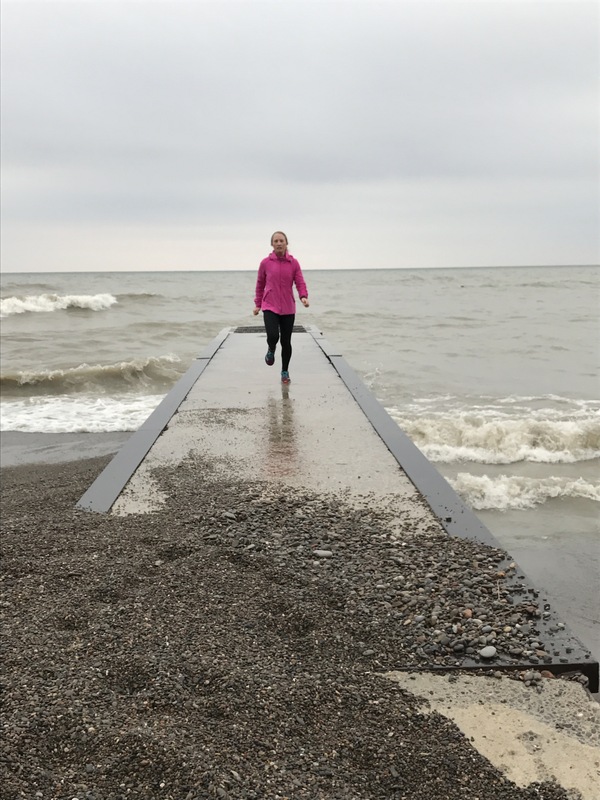 Sunday (Christmas): I took the day off to rest and fuel for my long run the following day! I also did 5 NTC workouts. Monday: 2 hours easy, my dad and I ran on the beach and then through the upper part of the neighbourhood for the second half of this run, it was a mild day and ended up being a 22km run. I was happy to do this run today so I could be tired for my return flight back to BC. Tuesday: 45 mins easy, I ran home from work, after getting home at 3am due to flight delays, the focus of this was just to get it done, but as always, I felt better after I did it. Wednesday: Group workout, we had a hill day, the route is called the 7 sisters as there are 7 hills to cover, it was hard work, but it was awesome to have someone else to do it with! I also did 30 mins easy which was owed from the previous day as a double run. Thursday: 80 mins easy, I departed from work out to Dallas Rd and then headed home through the lochside trail. Friday: Double run day, my first run of the day, 30 mins easy, started at 5:40am, what’s the difference? Dark in the morning dark in the night. After work, I did my second run, 50 mins easy back home. I don’t know about you but, I feel pretty badass when I do double run days! Saturday: This was promised to be a tough workout and it was! I also wanted to get some extra mileage in to hit my target, so I did an extra long warm-up. The workout was 4 sets of 5 minute tempo runs with jog breaks between. 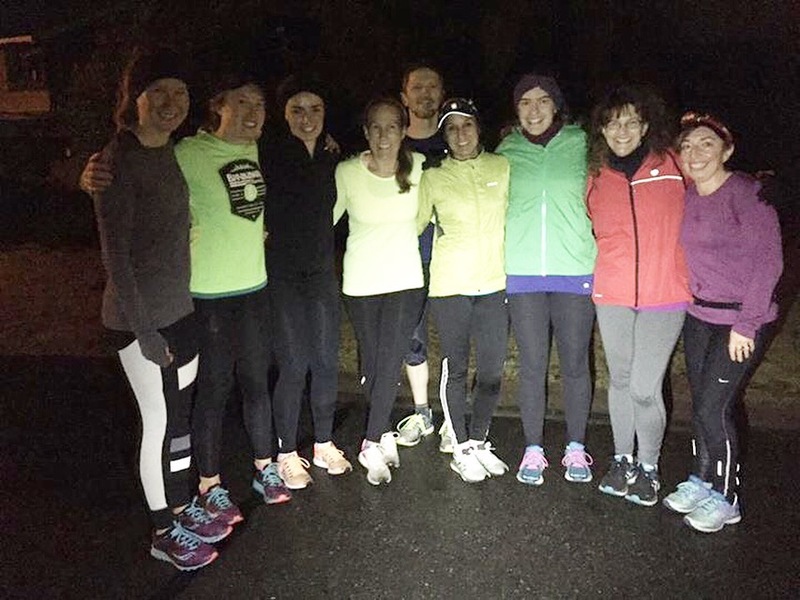 It was our last workout of the year and we ran on the trails around a lake, lots of other runners had the same idea, but it’s always great to see more people out there! Total Weekly Mileage: 99km (haven’t hit this since marathon prep). I also did 2 NTC core workouts. 2016 was a great year for running, I had a lot of new PB’s and ran my first full marathon, and am a few steps closer to my goal to qualifying for Boston. I am excited to see what I can do this year and I am sure it will be even better than the last.